Are you Looking for a Premium and Long Lasting Kitchen/Bathroom Soap Dispenser? Using the finest quality components, each one of soap pumps are made to last and it's a great addition to your Kitchen accessories or bathroom accessories. ✅ SUPERIOR QUALITY - Built with finest quality heavy duty stainless steel and PE plastic, our sink soap dispensers are acid and corrosive resistant, the Brushed Nickel finish allows it keep it look and shine for years to come even suitable as a commercial soap dispenser. ✅ QUICK INSTALLATION - Each package includes are simple step by step instructions. It only takes a couple of minutes to mount our sink soap dispenser on most kitchen sink, bathroom counters or any counter-tops. ✅ EASY TO REFILL - Simply remove the top of the dish soap dispenser, pour and refill it from the top. Say goodbye to the days of crawling under the sink. You'll be refilling this less often with the large 17 ounce / 500 ml capacity bottle. ✅ BUILT- IN RESPONSIVE SOAP DISPENSER PUMP - Each soap pump is easy to push and delivers drip free dish soap from the very first pump. It's been tested to work with dish soap, hand soap, liquid detergent and can even be used as a lotion dispenser. ✅ VERSATILE USE - The perfect and convenient addition to your kitchen or bathroom accessories for your every day needs. Use it as a dish soap dispenser, hand soap dispenser, bathroom soap dispenser, lotion dispenser or any soap dispenser. ✅ BUILT TO LAST - Our Brushed Nickel Soap Dispenser are made with heavy duty stainless steel and durable PE plastic. The shiny multi-layered Brushed Nickel finish makes it resistant to rust. 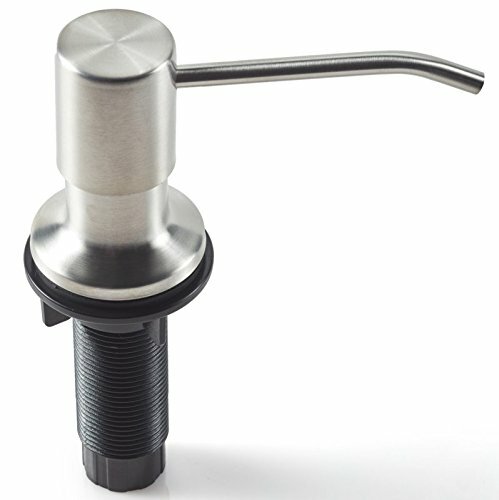 The soap dispenser pump mechanism is designed for long lasting performance to dispense consistently with each and every press. ✅ MULTIPURPOSE USE - Our Dish Soap Dispenser for Kitchen Sink can be used in a variety of ways whether you want to fill it up with hand soap, dish soap, liquid detergent or even hand lotion. You can use it as an extra hand soap dispenser to your existing kitchen soap dispenser or in your bathroom as a hand soap dispenser. ✅ QUICK & SIMPLE TO INSTALL - The Kitchen Soap Dispenser Pump comes with EASY to follow step by step instructions so you can install this on you kitchen sink or counter top within a couple of minutes. It comes in a large 17 oz / 500 ml capacity bottle so you won't have to refill it too often. Refilling takes no time at all. Simply refill it for the top. No more crawling under the sink! ✅ EASY TO CLEAN - To keep the Sink Soap Dispenser looking new, all you need to do is wipe it down with rag and warm, soapy water and the brushed nickel finish will shine and look brand new once again. ✅ 100% SATISFACTION GUARANTEE - We proudly stand by the quality of soap dispenser for kitchen sink that you can backed by our 30 Day no questions asked refund garantee as well as our 2 Year Replacement Warranty, so you can buy our soap dispenser for kitchen sink with confidence. Add this great kitchen sink accessories to your design today. If you have any questions about this product by Kimi Cuisine, contact us by completing and submitting the form below. If you are looking for a specif part number, please include it with your message.